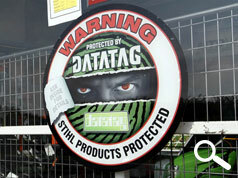 Datatag ID Limited, the leader in security marking and registration, has launched a new scheme in conjunction with Stihl, the manufacturer of power tools for professional forestry, agriculture, and garden and landscape maintenance, and Thames Valley Police to protect retail premises and Stihl products with their owners. Stihl are leaders in their field and their products are a popular target for professional and opportunistic thieves. End users have Stihl products stolen from workshops, vans, and job-sites and Stihl dealers are commonly raided by professional thieves when many thousands of pounds worth of equipment can be stolen at a time. The initiative kicked-off in April at Stihl dealer PA Turney’s premises in Weston on the Green, near Bicester in Oxfordshire. PA Turney have been raided and lost Stihl stock. This new initiative works in a similar way to the official equipment security scheme CESAR that Datatag manage on behalf of the Construction equipment Association (CEA), acting as a powerful deterrent against theft and an invaluable aid in recovery. Under the scheme each Stihl product is given a unique and permanent identity using state of the art Datatag security marking technology. The security marking includes liquid forensic DNA that thieves cannot remove, so the true identity of a piece of marked equipment can always be proven. An overt warning label shows that the piece of equipment is protected as a deterrent against theft. Once sold the new owner simply registers the equipment on-line with the details being stored on a secure database. In the unlikely event that the piece of equipment is stolen the police can identify the owner using the security marking technology and the registration database. Datatag has supplied PA Turney with a range of ‘point of sale’ material that informs visitors to the retail premises that the scheme is running and that individual pieces of equipment are protected by Datatag technology. 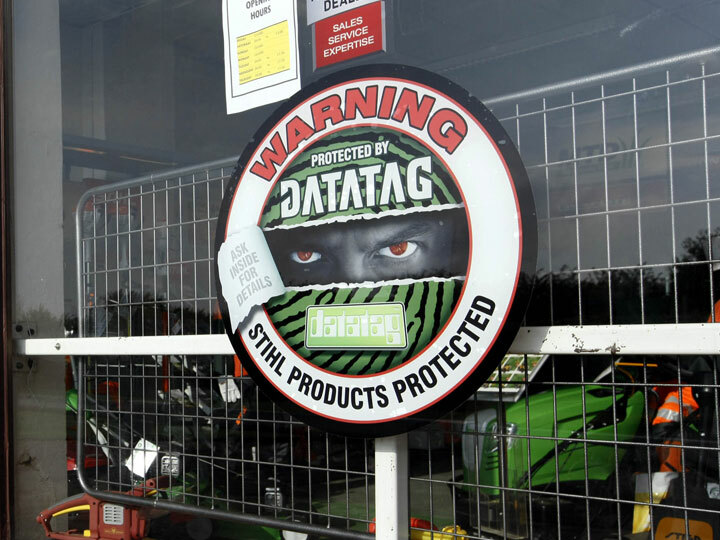 Stihl management and Datatag are confident that this new initiative will make a real difference to the rate of theft over time. The CESAR scheme, which uses a similar process and technology, has been hailed as a huge success by the Met Police’s Plant and Agricultural Intelligence Unit (PANIU). CESAR has made an impact in the 7 years since its launch in January 2007. The CESAR security marking and registration scheme now protects over 135,000 pieces of construction and agricultural equipment, making it the most successful scheme of its type anywhere in the world. The ‘CESAR effect’ has reduced overall equipment by 46% in the past 3 years, increased the rate of recovery of stolen equipment by a factor of 6, and helped reduce insurance premiums on equipment.